The performances took place on the steps of four different Georgian Houses on the street. 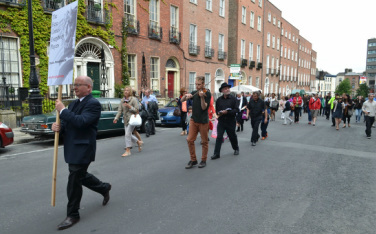 HCE actors, Donal O'Sullivan and Cathal Stephens and local Dubliner Brian Stephens participated. North Great George's street is the home of the James Joyce Centre and close to many important Joyce-related sites, including the (fictitious) home of Leopold and Molly Bloom at No. 7 Eccles Street and Belvedere College where Joyce attended school. The event was sponsored and organized by the North Great George's Street Preservation Society and the North Great George's Street Residents Association in association with the James Joyce Centre.